← Discuss: Tour de Crash 2011? Even if you’ve been living a sheltered life under some cobbled Flemish hellingen you’ve probably heard that in recent years, many wheel manufacturers have been following HED in offering an array of road wheels and racing wheels with a wider rim profile. Handspun, one of Pavé’s supporters, sent us a set of wheels to test. Handspun is a spin-off from Quality Bicycle Products, and is an expert wheelbuilding service that builds many fine sets of wheels. The wheels we rode are HED’s Novembre hubs laced to Belgium C2 rims, 24/28, laced 2-cross front and rear. In recent years I’ve been frustrated with the high cost of repairing boutique wheelsets. Now that my rear Campagnolo Eurus has decided to break a bunch of spokes, what am I to do with a Record-quality, 21-hole hub? Meanwhile, my Mavic Ksyrium SSC SL wheels keep creaking. They can be either trued, or tensioned, but not both. Based on these frustrations, I’ve come to learn that durability is a bit of a myth, but one can approximate it with simpler gear. Thus, my initial impression is that Handspun’s HED Novembre/Belgium C2 wheelset is a fine training wheelset. Were I to break a spoke, I could replace it with something available at my local bike shop; were I to trash the rim, I could relace it to anything with 28 holes. Both Handspun and HED also offer a variety of upgrades to this basic wheelset: Handspun offers DT Swiss hubs and DT Aerolite bladed spokes, and HED offers a line of wheels with carbon hubshells, titanium bits, and fewer spokes for those willing to lay out a few more dollars. Handspun’s wheelbuild is initially solid. As a musician (and a cyclist without a wheel tensiometer), I plucked the spokes to get an initial sense of their even tension, and gave the wheel a spin to check its true. Both were dead on. I intend to periodically check and re-check the tension and the true of these wheels as I put them through their paces this summer, on gravel-path training rides, criteriums, interval workouts, a week-long tour, and, getting into the fall, cyclocross training and racing. I’ll throw everything I’ve got at these wheels, and I’ll see what they throw back at me. Handspun and HED both tout the many benefits of wider rims; HED is not shy in taking credit for their adoption across both the pro peloton and the industry’s many wheel companies. The literature is that when paired with a 23mm tire, the wider rims create a constant tire profile with a more even transition from the tops to the sidewalls, thus improving handling and resulting in a smoother transition from the tire to the edge of the rim, thus improving aerodynamics. When I mounted the wheels and left the house I felt some pressure – would I even notice the difference? Wide rims have been around for a couple of years by now, but I’m a late adopter and have been riding ordinary old skinny rims. A lot of people already know what wide rims are “supposed” to feel like, but would I notice? Well, the differences between these wheels, and the Ksyriums I had been riding prior, were immediately apparent. The wide rims created a very tangible, noticeable, and positive difference in both handling and comfort. As I pointed my bike toward the trail heading out of the city, I went over some familiar ridges in the road – ones that would give my bike a solid ca-clunk(!) and cause me to lighten my grip on the handlebars lest I bruise my palms through thin bar tape. I’ve ridden this path plenty, but this time, the HED wheels’ wider rims make the bike feel as though it’s got wider tires on: they softened the impact. It felt like my stiff aluminum bike had fatter tires on it, or carbon seatstays, or just more give to it. I warmly welcomed this effect, and as I took the bike on to some of the more rotten streets and paths that I could think of – ones gouged by a winter’s worth of snowplows, or springtime flooding, or even just ones that still have cobbles on the surface (honoring the wheels’ namesake) – I felt the increased shock absorption of the wide rims. When I met David Cory, the Handspun Brand Manager who was generous with his time and gave me a tour of Handspun’s facilities, I asked him what led him to put such an emphasis on wider rims in Handspun’s offerings. His answer was simple: “I rode them.” The benefits, he said, are obvious. I concur, and I think most riders would, too. I followed roads to a desolate industrial park so that I could sprint around and dive into corners to see how they handle. 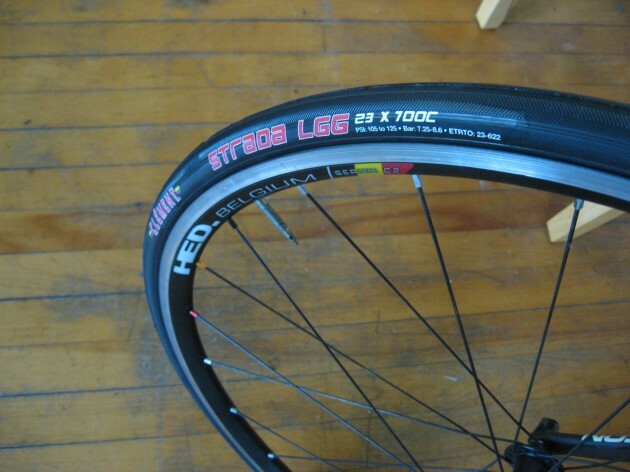 There’s some hyperbole that wide rims make clinchers feel like tubulars. From my experience, I don’t think that’s entirely accurate, but it’s close. With good tubulars, there’s that sense that the tires are glued to the ground underneath you and when you corner, they’re still grabbing the ground as they tug your bike around the corner. These do grab the ground underneath you and feel incredibly solid, urging you to turn harder and tighter by giving that hard-to-describe sense of confidence feeding back up through the bicycle – your front wheel gets stuck in a tight-radius turn. It doesn’t feel like placebos and snake oil – rather, it makes sense. The wider rim leads to a wider tire profile, and that means more rubber on the ground. More friction when you’re turning means you turn faster, tighter, with more control. I did some sprinting, “led out” by some gentle hills. My legs were mushy after a three-week vacation during which I mostly used my body for dancing and filtering wine. Take this with a grain of salt but I felt like I had a bit more at the top end of my speed, like I had a bit less resistance at the top end. Is this the aerodynamic advantage of the wide rims? I’m not sure – I’m not even sure if I felt what I felt (hey, maybe I had a tail wind). HED says there’s an aerodynamic benefit in a wind tunnel; if that’s true, that’s great, but quite frankly, that benefit is secondary to their marked improvement in comfort and handling over traditional rims. The bottom line, at this point, is that I like these wheels. They’re a smart wheel, and they feel great. They’re only initial impressions for now – I’ll be keeping a diary with some rough estimates of mileage, road conditions, and the status of the wheel so that we can check in about the level of use and abuse they’ve seen, and how Handspun’s wheelbuild holds up to the ringer I’ll put them through. This entry was posted in Equipment, Featured and tagged Belgium, handspun, rest day review. Bookmark the permalink. How do the Clement tires feel on those wheels? They're nice – fairly soft and grippy. They're a thinner "23mm" than some others I've used and I wouldn't mind seeing what a just slightly fatter tire could do. I'm also waiting for them to wear more, as durability is an interest of mine when it comes to tires. But thus far, they're certainly pretty nice. To what would you compare them? domesgique, sorry for the late reply. it's hard to compare them to other tires as i tend to stick with certain tires for several years at a time. And again I feel as though I can't properly evaluate a consumable item like a tire until I reach the end of its life. That said, initial impressions are that its pricepoint of under $40 seems appropriate for this tire. thanks for the preliminary review. i'm having a set built up to replace my open pros. gonna give them a rest and use these wheels for everything! keep us updated on your thoughts. thanks! I had a pair of HED Belgium's built w/ Chris King R45 hubs and DT Aerolite spokes. I am not a small guy (195 – 205 depending on how well I control my eating during the week) so I have 32 spoke count rear, and 28 front. These wheels are relatively light, and based on the past 2 months, completely bombproof. Had one adjustment after i rode on them for a week, and since then have been flawless. I was on DT Swiss R585's w/ CK Classic Hubs before (now a rain wheelset), they are also a great wheelset, but the HED rim's had me checking every 2 minutes on my first ride, I though I had a slow leak, because the ride was so much smoother, almost plush for a road bike. I am sold on the wide rims, the feel, the handling in and out of tight corners, for me it's a good fit. Considering having these built for all the reasons you mention so I very much appreciate the review. Wonder if you have an update? i got a set of these this fall and trained on them all winter. i have the handspuns' laced with dt 240's and aerolite spokes. They were not cheap, but good for a racer who doest like to stress about gear and cannot afford multiple wheelsets. You can train on them and race with them with confidence. If you crash them you can easily fix them. They feel stiff like a good racing wheel but not harsh. the wider rim bows out 23mm tires like 25s giving you a little more cush and security in the turns. i raced them in a crit last night for the first time and did not miss my deeper dish wheels. they spun up fast and felt totally secure in the turns. I dove right into the corners with confidence and felt fast in the straights. There was no fighting them through crosswinds. My only (minor) criticism is that i am not sure the bladed spokes make much of a difference. But they look cool and seem to tie together a really nice wheel system.